Americans rarely think about clothing waste. It’s hard to admit the problem even exists but it’s truly become a crisis that’s entirely hidden from us the moment we throw our unwanteds in a plastic trash bag and drop them off at Goodwill. We do the latter in droves with the EPA estimating the average American disposes of about 81 pounds of clothing per year. While 95 percent of those used textiles can be recycled, 85 percent land in the trash. One reason for this disparity could be the public’s perception of waste and recycling. Consider how long it took us to recycle plastic and you might understand the challenge ahead with textiles. But some fashion brands have been very transparent about how they are dealing with the problem. Take for instance womenswear label Eileen Fisher. Eileen Fisher has wanted you to know about their post-consumer textile waste since 2009, and has viewed waste as an opportunity to recreate and renew. Maybe even as a viable harvest for which to create a whole new genre of clothing. Since 2009, the Renew take-back program that’s embedded within the Eileen Fisher brand has recycled over a million pieces of clothing. “We do this to keep our beautiful, gently worn clothing in the cycle of use longer, and to disrupt the conventional and very toxic dye industry,” says Eileen Fisher Brand & Marketing Specialist Kerri Ulloa. 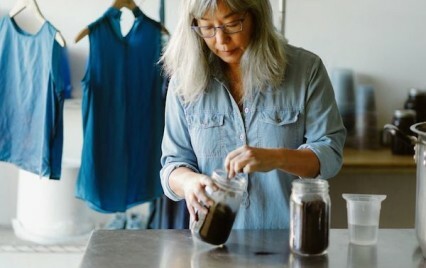 Annually, Eileen Fisher Renew and Seattle-based Botanical Colors, a natural dye supplier and production dye house collaborate on a special Earth Day event. This year, the collaboration takes a next step in their relationship offering online shopping as well as bi-coastally in both the Irvington, New York as well as the Seattle Renew stores. 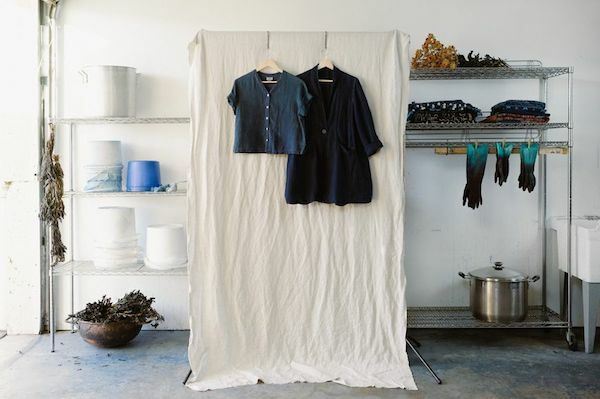 In this 2019 collaboration, Renew and Botanical Colors worked together to overdye slightly flawed Eileen Fisher clothes using plant based indigo and ancient dye techniques. The collection of one-of-a-kind Renew overdyed items will be for sale from April 9th to the 27th in Renew’s Seattle and Irvington, New York stores. The two companies will also celebrate their collaboration (and Earth Day) by hosting a community indigo dip at the Columbia City, Seattle Renew store and launching their very first circular design shop on eileenfisherrenew.com to showcase the indigo dyed clothing. Botanical Colors, internationally known as a permanent fixture in the natural dye world, has been aiding artisans as well as the fashion industry towards non-toxic and biodegradeable dyes for over a decade. “Clothes mending and reuse has taken the stage as a ‘badge’ that the wearer has renewed a beloved garment and saved it from the landfill,” says Botanical Colors Founder Kathy Hattori. Read the full article on HandEye magazine. Images courtesy of Sonja Lyon.